The Honour Board, which is installed over the vestry door, is the work of Blanche Francis who was responsible for the carved wooden reredos in the Sanctuary. Miss Francis was responsible for quite a number of Honour Boards around the State and we are fortunate to have two examples of her work in the church. The board was the gift of Sir Lancelot and Lady Stirling whose three sons are included amongst those being remembered. Born in Port Pirie, Harry was a clerk who enlisted on 31 August 1915 when he was 22. At the time his mother, Mrs Lillian Muriel Butler lived in Strathalbyn. He saw service in France and returned to Australia on 18 February 1919. Born in North Adelaide, Piers was a 40 year old farmer when he enlisted on 7 March 1917. He had sold his farm and his wife, Faith Julia and their four children went to live in Largs Bay. He had been an active member of the Strathalbyn Rifle Club and the Agricultural Bureau. He saw action in France but suffered ill-health and was deemed “Medically Unfit” when he returned to Adelaide on 25 January 1919. Jack Verton Elliott was born in Strathalbyn on 4 March 1892. The son of Joseph William Elliott and his second wife, Matilda (née Robinson). His father was well-known in Strathalbyn as the proprietor of the “Southern Argus”, a keen musician and a long-serving Mayor of Strathalbyn. Before enlisting in the Navy in November 1911 Jack Elliott had been employed by the Municipal Tramway Trust in Adelaide while studying subjects for a diploma in Electrical Engineering. At the same time he was a Naval Cadet and did well in a rifle competition. According to an article in the “Southern Argus” he had joined the fledgling Australian Navy in order to pursue his interest in electricity and wireless, “He has from childhood been keenly interested in electrical studies, and at present does a good deal of experimental and research work, chiefly in connection with wireless telegraphy, with which branch he is most intimately connected in his duties.” “Southern Argus”, Thursday 20 June 1912, page 2. After serving a number of years at Williamstown, Victoria, from 29 May 1915 to 18 September 1916 Jack served on HMAS Encounter in the Pacific before returning to Australian waters. During this time he had advanced to Electrical Artificer Third Class and been awarded two Good Conduct Chevrons. On 31 October 1916 he joined HMAS Brisbane until completing his seven years’ service on 3 September 1919. Jack Verton Elliott married Doris Russell Good at St Chad’s , Fullerton SA on 14 October 1930. They had at least one son who was born 5 October 1932. In the 1930s and 1940s they were living at 15 Jenkins Avenue, Myrtle Bank, and in 1950 Jack was appointed as a Senior Technician in the Fourth Division, Engineering Branch of the P.M.G in Adelaide. Doris died 19 August 1968. Jack died 6 August 1979 and was buried at Centennial Park, Pasadena SA. Born in Macclesfield, Lawrence was a 21 year old Draper’s Assistant when he enlisted on 14 August 1916. His parents were Mr J. L. Lovick and Mrs Mary Lovick of Strathalbyn. He saw action in France from March 1917 but was hospitalised in June suffering from Gas poisoning. Returning again to the field, he died from wounds received on 26 May 1918. At first he was buried at the Vaux-sur-Somme Communal Cemetery but later his remains were exhumed and re-interred at the Villers Brettoneux Military Cemetery. Born in Orroroo in 1887, Keith was a pharmacist in Strathalbyn when he enlisted on 9 November 1915. His mother, Mrs Catherine Mary Marsh lived in Commercial Road. Because of his qualification as a chemist he was appointed to the Sea Transport nursing staff as a dispenser and made several voyages between Australia and England. He was discharged on 10 August 1919. Born at Long Plain near Strathalbyn on 24 April 1890, the son of George W. H. and Elizabeth A. Parker, George enlisted on 10 July 1915 as a Private and saw action in France. He was promoted to Lance Corporal on 1 July 1916, Temporary Corporal on 19 August 1916 and Sergeant on 5 September 1916. During the battle of Pozieres he was awarded the Military Medal and later received gunshot wounds which necessitated hospitalization in England for two months. He returned to France and was wounded again in February 1917 which again resulted in a time in hospital in England. Once more in France he was promoted to Company Sergeant Major on 4 June 1917. He was awarded the Distinguished Conduct Medal in November 1917 for bravery and devotion to duty in operations near Zonnebeke in September. On the 25 January 1918 he joined “Dunsterforce” an Allied special mission in the Middle East but contracted typhus in July and was dangerously ill. After his recovery he returned to France and arrived back in Australia in July 1919. He was not to enjoy a long life back in Strathalbyn. He died accidentally on 10 August 1921 when attempting to negotiate a fence with a loaded shotgun. 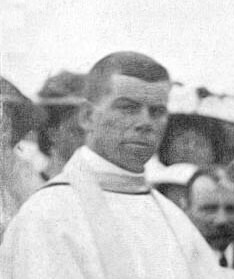 Percy Wood had been Rector of Strathalbyn since 1910. “When, the war broke out, Mr. Wood, having a wife and four small children, did not at first see his way clear to enlisting, but when in 1915 he learnt that there was a dearth of chaplains, he at once offered his services, and was given a commission, first as a Transport Chaplain, and the following year for continuous service. Edward Guy Stirling was the eldest son of Sir Lancelot Stirling and his wife Florence. He died at Victor Harbor on the 22 August 1945 after a short illness. “He was a qualified architect, and served with the Grenadier Guards in the first world war. He came to Australia after the war, and was recognised as one of the outstanding country golfers in the State. He had few equals in Australia as a putter. The late Mr. Stirling built a house about five years ago at Victor Harbor on the Hayborough estate, and lived in retirement. He was single.” “The Advertiser”, Thursday 23 Aug 1945, page 6. Lancelot Eric Stirling was born on 12 September 1885, the second son of Sir Lancelot and Lady Stirling. He was educated at St Peter’s College and when he enlisted gave his employment as “horse breeder and sheep farmer. He married Clarace Myrtle Jackson on the 22 February 1917 at St Andrew’s, Strathalbyn. “Southern Argus”, Thursday 22 Mar 1917, Page 2. Archibald Keith Stirling was born on 22 September 1890, the third son of Sir Lancelot and Lady Stirling. When he enlisted he was employed as a Station Overseer. He died at Angaston on 26 April 1954. Murra y enlisted in April 1915 at Keswick and after serving at Gallipoli and in Egypt died of Pneumonia in Egypt on 27 January 1917. “Mr. and Mrs. C. L. Taylor, of the National Bank, Strathalbyn, have received news that their youngest son. Corporal Murray Gleeson Taylor, died at Cairo from pneumonia. He was born at Strathalbyn. In April, 1915, he joined the 9th Light Horse as a private. He sailed for Egypt in August of that year, served on Gallipoli, and was there at the evacuation, when he returned to Egypt, andserved continuously until the time of his illness. He took part in the Romani battle, and was afterwards promoted to the rank of corporal. His brother, Jack, is also in the Light Horse.” “Chronicle”, Sat 17 Feb 1917, page 45. Jack enlisted in July 1916 and arrived in Suez in February 1917 and soon after was dangerously ill with pleurisy. In September 1918 he was discharged from the Light Horse and transferred to the 1st Australian Flying Corps as an Aircraft Mechanic. He would return to hospital quite a few times and was eventually discharged as medically unfit in May 1919. Henry Illingworth Taylor was born in Daylesford, Victoria on 21 July 1889, the youngest son of Norman Taylor and his wife Emma Sarah (nee Woodruff). His father was a skilled artist, geologist and botanist who had been employed by the Victorian Government. His father died on 22 June 1894 and his mother came to live in North Adelaide. Henry was a Bank Accountant with the National Bank when he enlisted in August 1915 and on the 9th December 1915 he married Dorothy Sarah Kingsnorth Mallyon in St Paul’s Church, Port Pirie. The bride’s father, William Kingsnorth Mallyon was the manager of the Port Pirie branch of the National Bank and the church there was also designed by him, one of twenty-nine churches he designed, mostly in the mid-north of the State. Henry and Dorothy had one son who was born towards the end of 1916 and Dorothy subsequently died at her home in Walkerville on 31 October 1916. The baby was then looked after by his maternal grandmother, Susan Mallyon until her death on 28 May 1918 after learning that her younger son Alfred Kingsnorth Mallyon had been killed in action in France on 3 May 1918. Henry Taylor also saw service in France and was wounded in August 1917. A more serious problem was that he was becoming very deaf and feared that he would find it difficult to return to his previous employment. He therefore applied for a discharge in July 1918 so that he could return to Australia, find employment and look after his twenty-two months old son. A 23 year old farmer prior to enlisting on 7 March 1916, he embarked for overseas as a Private with the 3rd Reinforcements for the 50th Battalion from Adelaide on 13 July 1916 aboard HMAT Seang Bee. Following further training in England, he joined the 50th Battalion in France on 7 February 1917 and was wounded in action at Noreuil on 2 April. Despite his wounds he carried on fighting and was awarded a Military Medal for his bravery. After being evacuated to England for medical treatment, he recovered and rejoined the battalion at the end of August 1917. He was wounded in action on the second occasion at Westhoek Ridge, Belgium on 29 September 1917. Two months later, he rejoined the battalion and was promoted to Lance Corporal on 17 January 1918. Lance Corporal Woolfitt, MM was killed in action at Villers-Bretonneux, France on 25 April 1918 and buried in the Adelaide Cemetery at Villers-Bretonneux. Private Percy Joseph Clark, 32nd Battalion, A.i.F. Percy Clark was born at Sandy Grove and was a 30 year old farmer when he enlisted on 2 November 1916. He embarked on the “Berrima” on 16 December and arrived in Devonport, England on 16 February 1917. He was admitted to the Fovant Military Hospital with Bronchitis on 25 February and died on the 14 March. He was buried with full Military Honours on 17 March at St Edith’s Church, Bavenstock on Salisbury Plain. Percy’s brother, Eardley enlisted on 26 October 1916. He had been born in Blanchetown and was a 35 year old miner. He was married to Hilda Elsie (nee Hopegood) and they had five children. He sailed for England at the same time as his brother on the “Berrima”. After arriving in England he went the the Third Training Battalion in Durrington on the Salisbury Plain on 18 February 1917 and would remain there, except for a short stay at nearby Fargo Hospital, until proceeding to France on 3 May. He was wounded in action on 8 October, suffering gun shot wounds to the face but returned to his unit at the end of the month. No doubt because of his experience as a miner Eardley was detached for duty with 177 Tunnelling Company during January 1918. He was on leave in the U.K. before being detached again for duty with 184 Tunnelling Company on 10 March 1918. On the 20 February 1919 the Court of Enquiry determined that Pte E. A. Clark had been “Killed in Action”.